The Cosmo is the newest roost deflector model designed by Acerbis' R&D department. The Cosmo accommodate a neck brace with the front Plate featuring a removable cover and the rear plate is formed to also accommodate the brace. The Cosmo features an ergonomic design that follows the natural shape of a riders back and features a removable bottom plate to accommodate riders with shorter torsos. 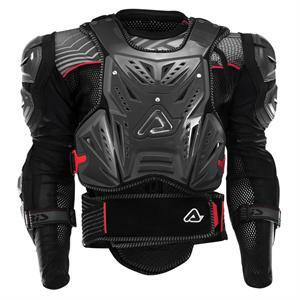 It has the option of combining the upper shoulder, arm and elbow protection or wearing it without to suit the rider. The Cosmo is complete with D3O material in the vertebrae protection column. The D30 material is a specially engineered material made with intelligent molecules. They flow with you as you move but on shock lock together to absorb the impact energy. The Cosmo includes removable adjustable straps, adjustable kidney belt with elastic strap and double Velcro closure, PE preformed padding and front padding that extends across the chest and on the back in two parts (one of which is removable and washable). The front, back, elbow and shoulder guards are all certified. When combined there is a short and tight bodice made of elastic material with mesh inserts that ensures breathability. When the Cosmo Jacket is combined, the loose arm guards are not included. COPYRIGHT 2019 MX1WEST. All Rights Reserved.